Crash course: Hosteling – How to make the most out of it? It all started nine months ago with me trying to find an internship. 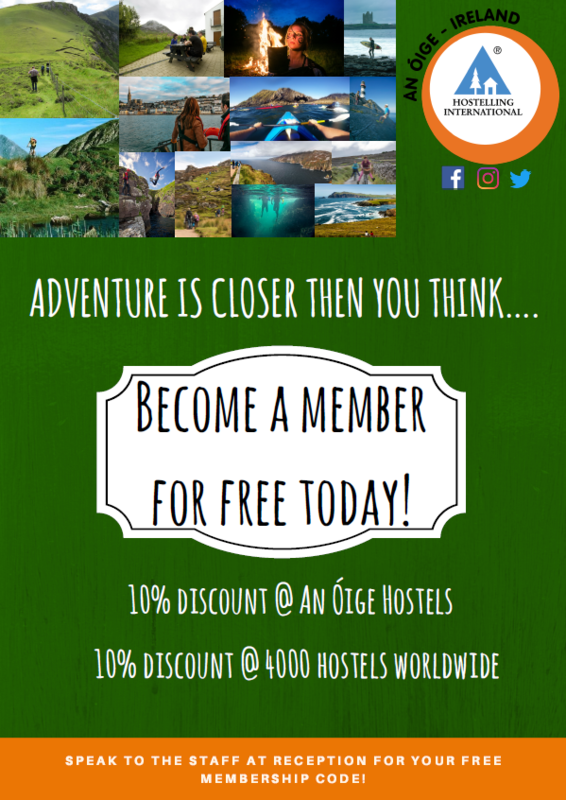 With a little luck I stumbled across a great spot – the An Óige marketing team… and this is how I ended up living in Dublin International Hostel. This one-of-a-kind experience inspired me to write a crash course in hosteling and share a little bit of wisdom I’ve picked up along the way! Not going to lie to you, when I first arrived I was so stressed out. Even though the place is very clean and tidy, with welcoming people, it is still a shock having to get used to living in a room with three other people. Fortunately for me, I was accompanied by my older sister for the first couple of days. As you can imagine, siblings are the best travel companions. If you complain they make fun of you, if you are unhappy or feel stressed, guess what happens? It literary applies to any situation. My point is, do not show any weaknesses or fear, they can smell it and when they do, they will…. make fun of you. Thus, my first advice to you: Do not let your spirits fall! So let’s get back on track! 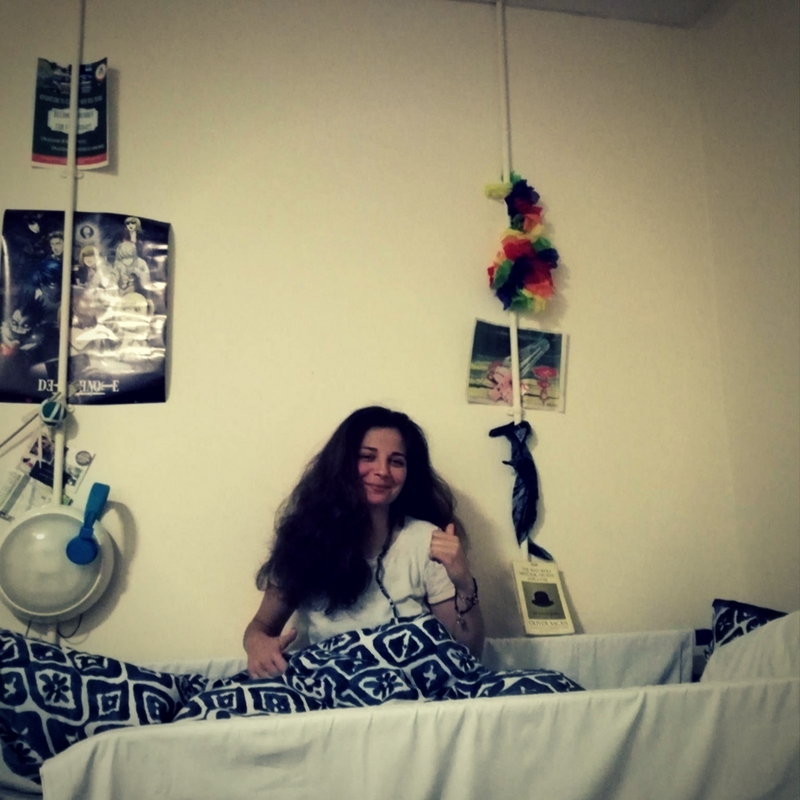 You are probably wondering why a hostel bed with some random stuff hung on the wall? Well these doohickeys literary represent my life in the past months. Each one of them connected to a different, but rather important person. If you ever wondered what life in a hostel would be like… well this is one possible case scenario. 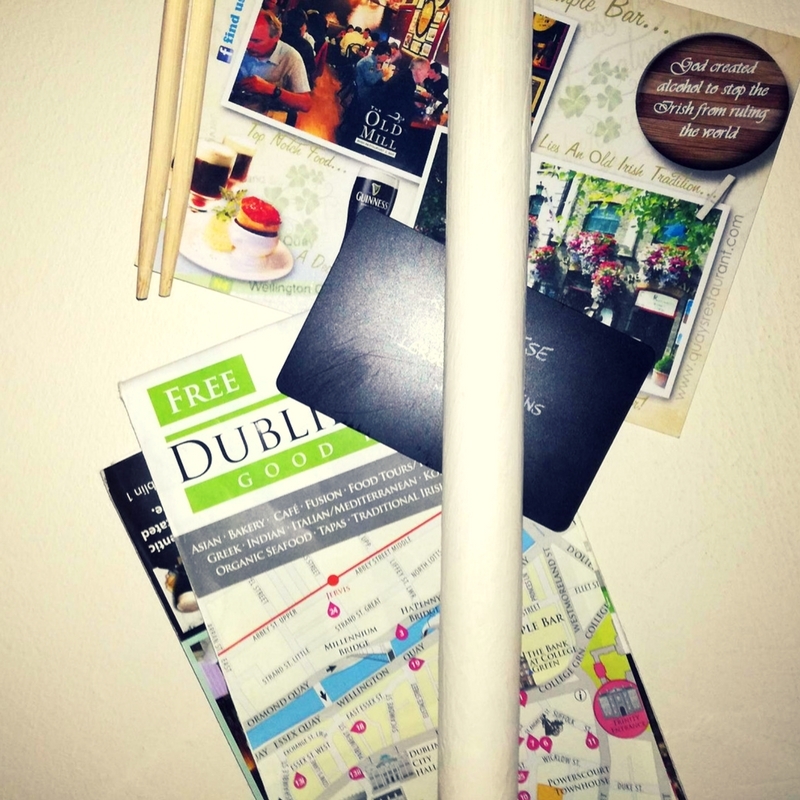 As you can see, the first two items I gathered during my quest in Dublin were a map (essential for survival in any new place) and a post card. For those of you who use their phone for navigation, believe me, nothing makes an experience more authentic then starring clueless at a map in the middle of the street, having nice Irish people ask you if you need any help. You just won’t get that if you’re staring at your phone! 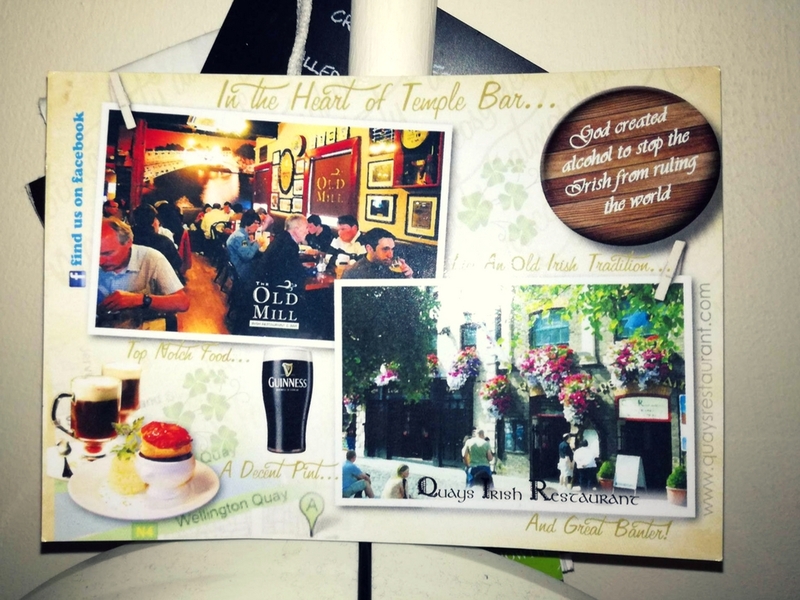 #2 – A postcard from The Old Mill Restaurant – best Chowder I have ever tasted! Next from the wall is a post card. 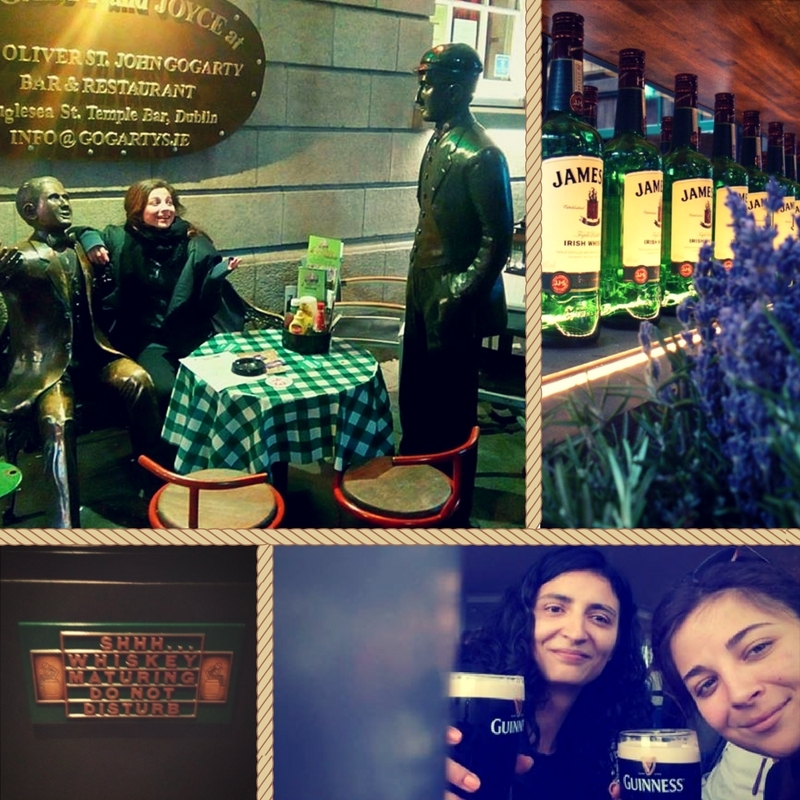 On the top right corner you can see an Irish proverb which goes like this: ”God created alcohol to stop the Irish from ruling the world.” The reason I was so fond of this saying is because, yes it is a stereotype that Irish know how to drink, but that is far from their best quality. The thing I admire most about them is their kindness. It was exactly the community and their attitude that made me fall in love with this country. If you are to walk around the streets of Dublin and bump into someone by accident, if that person is Irish, he or she would immediately apologize even if it was your fault. If that is not considerate, that I do not know what is! My recommendation to you: ”Treat people the way you want to be treated.” If you follow this simple saying, you will have no problem living in Ireland. 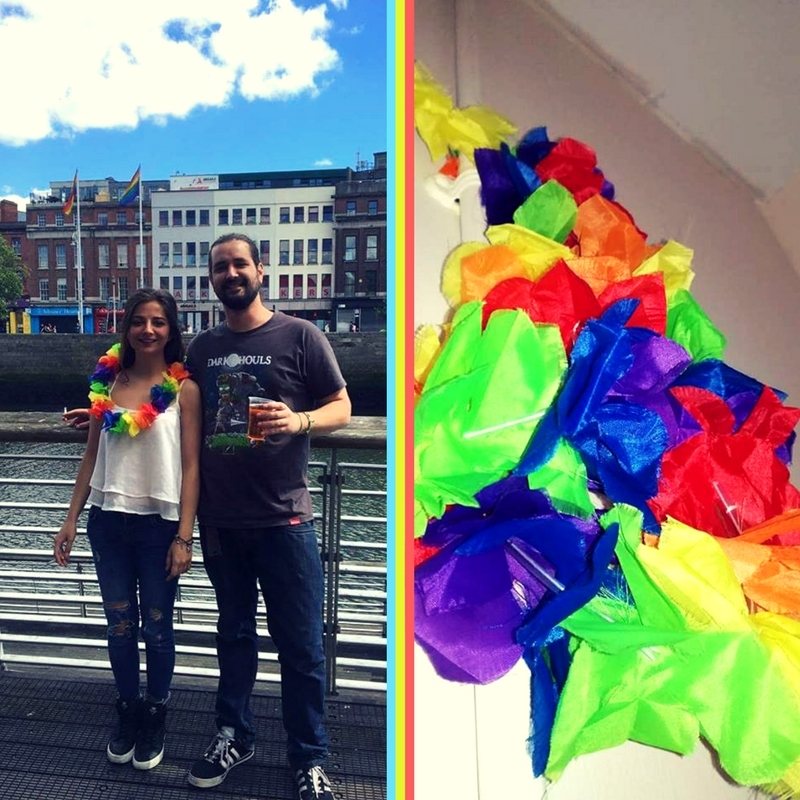 #3 – An Irish LGBTQ Parade – This is how it should be done! This flower garland I bought for Pride which took place on the 24th June. Truly fascinating, if I were to compare it to the parade back home (which would be Bulgaria) this was pro league. Everyone was dressed in a rainbow outfit, with a big smile and ready to have a good time. It was astounding: the crowd, the atmosphere… I honestly never imagined people could be so diverse, open-minded and free to express themselves. No one would judge, everyone could be himself or herself or themselves! A parade which reminds us that no matter what your outlook or appearance is, in the end the only thing that matters is your personality. It teaches us a valuable lesson or in other words – Be yourself! Show your true colors! And most importantly – Don’t be afraid what others would think of you. 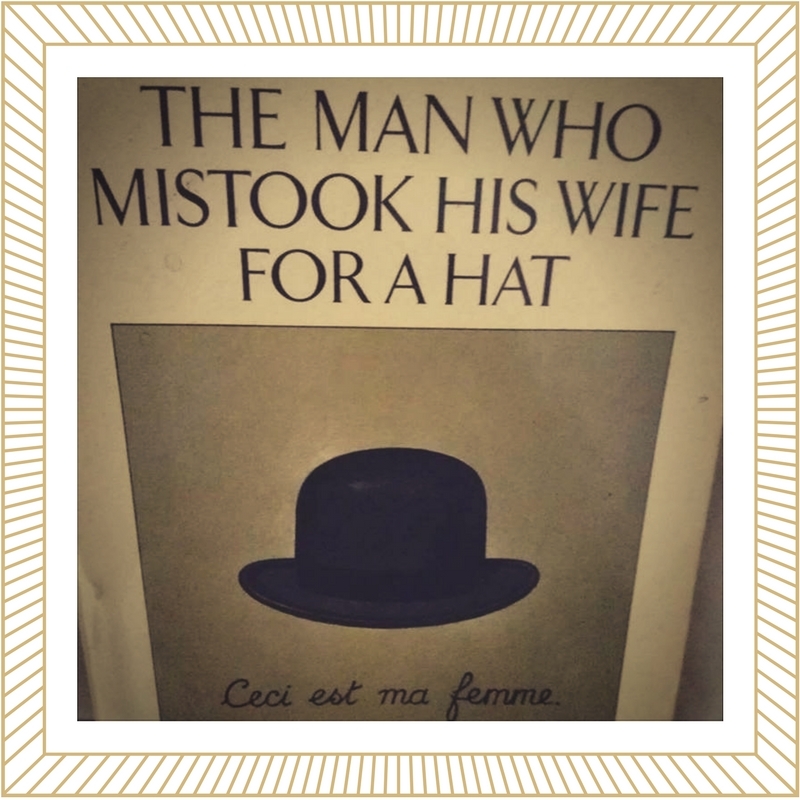 #4 – A book is a man’s best friend! This book over here is probably the most important item of them all. Thanks to it I managed to survive seven hours in Birmingham waiting for my transfer flight back to Bulgaria. It was because of this amazing little piece of literature that I managed to remain sane. Hence, the next key point is: always bring a book when traveling. Every true hosteler should have one in their bag. You know, just in case. If not for traveling, then just to enjoy it in your free time. For me the best way to relax after a day of work is to take my book, go to the park and just get into the story. Once I finish reading my book I would feed the ducks. Yeah you heard me right. I am in my twenties and this is one of the things I am most fond of! DON’T JUDGE ME! On the bottom left side you can see a poster… Where did it come from? From the North. Not from Castle Black nor the wall, more like Northern Ireland where we can find the beautiful city of Belfast. 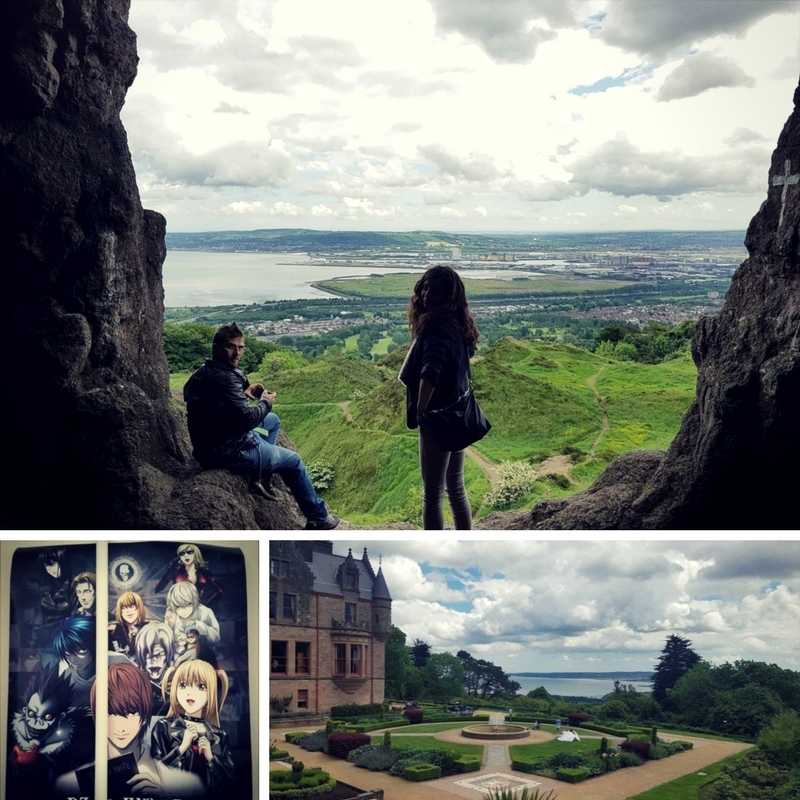 Fun fact: some of the scenes from the series was actually filmed in that part of Ireland, because there you not only have mesmerizing landscapes, but also an abundance of castles. Perfect location don’t you think? PS. If you want to learn more about your favorite TV series, here are some links you can check. Simple advice: If you ever have the opportunity to travel, do not think twice! Pack your bags and go, the rest you can figure out as you go along. #6 – The best piece of art on my hostel wall! Part of the hostel experience includes you spending time in the staff kitchen preparing food and talking to random people. Embrace that feeling, because even if it does not seem like it, you can always learn a thing or two from strangers. Either about their country, their culture or whatever other topic intrigues you. Sometimes you may feel like you just want to sit down, eat your food and just enjoy your quality time so what better way to do that if not to read a newspaper. I mean you should also learn about the country you are living in! Am I wrong? This is probably not be best example as it is not actually related to Irish politics, but just a hilarious cartoon of Donald Trump. It was around Easter when one day my friends and I were quietly enjoying our lunch while reading the newspaper. Then all of a sudden we saw this and could not stop laughing. One of the reasons why we found this tragic event so funny is because just the day before the stumbled across a video of Trump in which he talks about the bombing. The shocking part about it was that he could talk in such detail about the delicious chocolate cake he had, but he did not seem to recall which county he bombed. 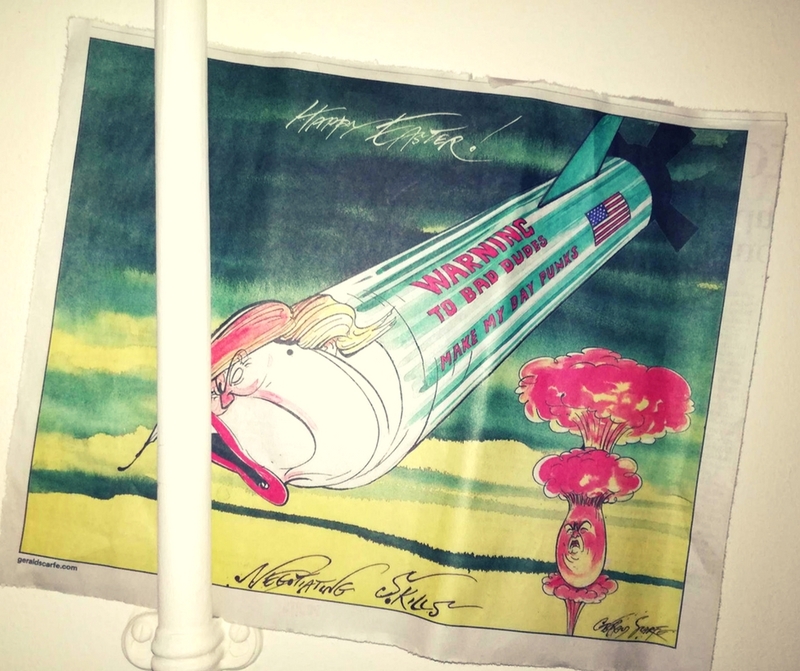 So long story short, this is how Trump ended on my wall of fame. You can see this poster hanging on the top left side of my hostel wall. It was designed by my colleague who is a programme coordinator for An Óige. Believe you me this is not an attempt to sweet talk you into getting a membership. It is just me showing you a small part of what we do here. As this was my first time working in an office, you can imagine how stressed I felt. 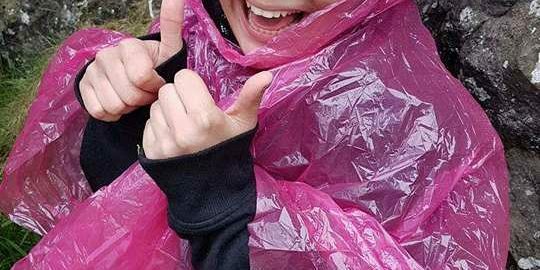 I can just tell you that this experience was far more than I have ever expected. My colleague, even though very busy with his own work, has helped me every step of the way; giving me advise and answering all my questions… trust me they were a lot! Thus, I can surely say that luck was on my side when choosing this internship. My last piece of advice to you: Follow your instincts! Mine led me to Ireland, to An Óige and to a whole new family. This hostel was truly my home and if I could do it all over again I would not think twice! If you found my story intriguing and would like to find out more about hosteling, events and various other personas who share a similar story, well then sign up for our newsletter.